Abbot Suger should play a central role in any course on medieval art. 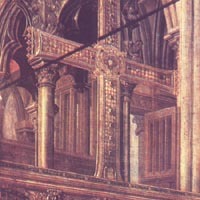 As the Abbot of the French Royal Abbey of St. Denis, north of Paris, Suger was responsible for the redesign of the west facade and the east end of the church. We will examine these additions to St. Denis later in the course in the context of the beginnings of Gothic architecture. Suger also left us two texts pertaining to his contributions to St. Denis: De Administratione and De Consecratione. Suger's discussions of his additions are relevant to our discussion of the art of the medieval church treasury. Compare the following description of the Golden Crucifix to the poem, The Dream of the Rood. Alison Stones presents an excellent overview of the treasury of St. Denis. We applied to the perfection of so sacred an ornament not only these but also a great and expensive supply of other gems and large pearls. We remember, if memory serves, to have put in about eighty marks of refined gold. And barely within two years were we able to have completed, through several goldsmiths from Lorraine -- at times five, at other times seven-- the pedestal adorned with the Four Evangelists; and the pillar upon which the sacred image stands, enameled with exquisite workmanship, and [on it] the history of the Savior, with the testimonies of the allegories from the Old Testament indicated, and the capital above looking up, with its images, to the Death of the Lord. Hastening to honor and extol even more highly the embellishment of so important and sacred a liturgical object, the mercy of our Savior brought to us our Lord Pope Eugenius for the celebration of holy Easter (as is the custom of Roman Pontiffs, when sojourning in Gaul, in honor of the sacred apostolate of the blessed Denis, which we have also experienced with his predecessors, Callixtus and Innocent); and he solemnly consecrated the aforesaid crucifix on that day. Out of the title "The True Cross of the Lord Surpassing All and Every Pearl" he assigned to it a portion fro his chapel; and publicly, in the presence of all, he anathematized, by the sword of the blessed Peter and by the sword of the Holy Ghost, whosoever would raise his hand against it in reckless temerity; and we ordered this ban to be inscribed at the foot of the cross. 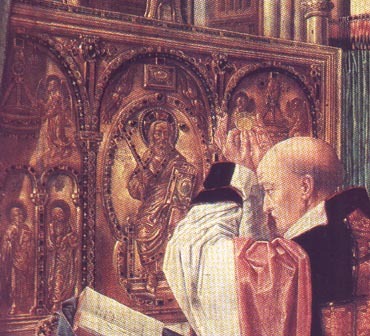 We hastened to adorn the Main Altar of the blessed Denis where there was only one beautiful and precious frontal panel from Charles the Bald, the third Emperor; for at this [altar] we had been offered to the monastic life. We had it all encased, putting up golden panels on either side and adding a fourth, even more precious one; so that the whole altar would appear golden all the way round. On either side, we installed there the two candlesticks of King Louis, the son of Philip, of twenty marks of gold, lest they might be stolen on some occasion; we added hyacinths, emeralds, and sundry precious gems; and we gave orders carefully to look out for others to be added further. The verses on these [panels] are these. In addition to that which King Charles has given before. May he perish, deservedly damned, associated with Judas." The true Victim offered at the Lord's Supper has carried all men. He Who saves all men on the Cross hastens to carry the cross. The promise which Abraham obtains for his seed is sealed by the flesh of Christ, Melchizedek offers a libation because Abraham triumphs over the enemy. They who seek Christ with the Cross bear the cluster of grapes upon a staff. Often we contemplate, out of sheer affection for the church our mother, these different ornaments both new and old; and when we behold how that wonderful cross of St. Eloy --together with the smaller ones--- and that incomparable ornament commonly called the 'Crest' are placed upon the golden altar, then I say sighing deeply in my heart: "Every precious stone was thy covering, the sardius, the topaz, and the jasper, the chrysolite, and the emerald [Exekiel 28:13]." To those who know the properties of precious stones it becomes evident, to their utter astonishment, that none is absent from the number of these (with the only exception of the carbuncle), but that they abound most copiously. Thus, when --out of my delight in the beauty of the house of God-- the loveliness of the many-colored gems has called me away from external cares, and worthy meditation has induced me to reflect, transferring that which is material to that which is immaterial, on the diversity of the sacred virtues: then it seems to me that I see myself dwelling, as it were, in some strange region of the universe which neither exists entirely in the slime of the earth nor entirely in the purity of Heaven; and that, by the grace of God, I can be transported from this inferior to that higher world in an anagogical manner. And, in seeing this light, is resurrected from its former submersion.